Thanksgiving is over, Black Friday and Cyber Monday are over as well. One final note about Thanksgiving is about the turkey. There are many ways to prepare this bird. One favorite technique is deep frying. Now this has become a rage in the past few years. And I have pointed out the pitfalls of not doing it right. You get one very delicious turkey when done right. Personally the deep fryer is the way to go (east to clean, close the lid etc) but many get those hulking turkey fryers available all over the place these days. No need to play the warnings here. Go to You Tube and see the disasters of turkey frying. Here is a satirical melody about turkey ruined by deep frying the wrong way. Today is called Black Friday or as it used to be known, the day after Thanksgiving in the United States. It is not an official public holiday though many government employees and a select number of private companies do take the day off. Schools are generally out as well so a lot of kids from grade school to college have the day off. The day after Thanksgiving has been a major retail event for decades. And the term “Black Friday” likely came from such overwhelming numbers of people and vehicles filling the streets, sidewalks, and malls on this particular day. The sheer masses of people trying to get into stores or malls creates hazardous situations. People being stomped on or worse hacve occurred. Criminals like to take advantage of the situation to rob shoppers, stores, or break into cars. It bears remembering that if you leave anything visible in the car such as backpacks, bags, GPS devices and mobile phones that it may trigger a smash and grab. Black Friday is often used to measure consumer spending for the upcoming Christmas season. Merchants use the data from the sales made to forecast what the projected seasonal earnings will be. If modest or low, it tells them the rest of the season will be lackluster unless they step up their marketing. 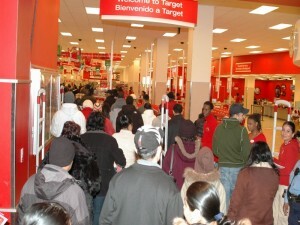 If sales are booming, then retailers are looking forward to a prosperous Christmas season. Of course if you want to avoid the whole Black Friday mess and have access to the internet, you can shop from the comfort of your home. Why stand outside a store for hours when you can order the very product you want, often with the same discount, when you can do it at home? That is something likely to get stronger if the present trends hold up which is why there is now a Cyber Monday. Halloween has come and gone, Linus once again mourns the Great Pumpkin did not show up, and Christmas decorations are starting to appear. Fall is now apparent with its cool nights and moderate warm days punctuated by rain here and there. Although it is still very early, Christmas jingles are starting to be heard in commercials. In San Francisco, city workers are hard at work putting up Christmas lights and decorations on Market Street. With standard time, they will be seen by commuters early in the morning and as they leave at night. Thanksgiving is not far off so many are already making plans for the Great Feast. Thanksgiving is normally a day to relax but alas some retail stores do open on that day in the hopes of luring shoppers with great deals. Coats that have been little used are being fetched out, cleaned, and worn again as the days get a bit cooler. Sometimes very cool depending on how far north you live. But for my friends down in Australia, spring is coming to an end and summer will begin with the solstice in December. Their December is mostly pleasant and warm. It is sort of odd to hear that tune with the lyric “…. Jack Frost nipping at your nose…” as you grill food and sit back in shorts to enjoy a fine meal. I guess it is all a matter of perspective since I know a guy who fires up his grill in the dead of winter to cook pork chops. But winter is still a ways off and we are in early November. So we say welcome to November and begin our trek into the Christmas season and to the New Year. Once again we are in the Halloween season. Pumpkins and scary decorations now adorn porches, patios and lawns. Here is a clip from the Disney animation classic The Adventures of Ichabod and Mr. Toad (1949). Of course if you want a more scary headless horseman you can view one here. 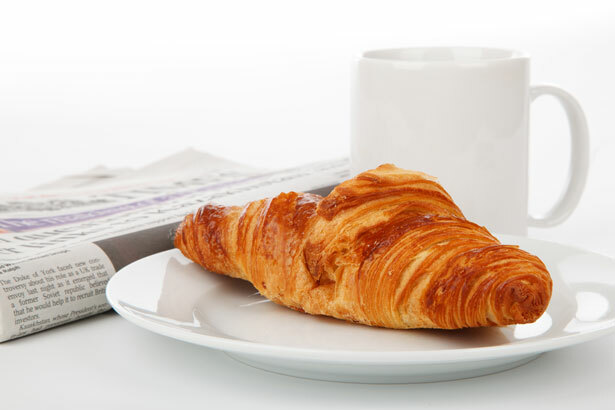 Have a nice Saturday everyone. 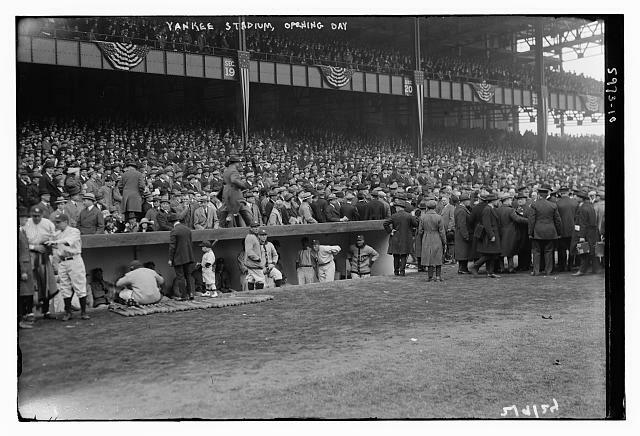 Bain News Service, P. (1923) Yankee Stadium opening day, 4/18/1923. , 1923. 4/18/ date created or published later by Bain. [Photograph] Retrieved from the Library of Congress, https://www.loc.gov/item/ggb2006011183/. Labor Day Weekend is here in the United States and that means summer is unofficially over. Straw Hat weather is still in play though. That is an old fashioned term in which men wore straw hats and summer clothing generally from May 15 to September 15. Then straw hats and summer clothing were put away and warmer winter clothing would be put on. Men were expected, even if it was warm, to wear heavy clothing right up to May 15. Today of course that tradition has faded though the hats remain. If you look back at photographs taken at ball games between 1920-1960, most men wore hats and even ties. My how fashion has changed. Today at most sporting events most wear casual clothing such as caps, jeans, and tee shirts. The only people who are dressed formally are league officials. Summer of course is the warmest time of the year whether in the north or south hemispheres. Days are longer and when clocks are set an hour ahead, you seem to get more sunlight. It is really an illusion we are giving our ourselves. And once the Summer Solstice has come and gone, there a slow but steady decrease in sunlight. By September those seconds of less sunlight have become minutes. The sun is now setting earlier than it did and with the Autumnal Equinox people who left home at 6:30 am in sunlight will soon be in darkness. The days start to become cooler especially the more farther north you are. Labor Day Weekend though is the time to have one final blast of summer before autumn and then winter sets in. 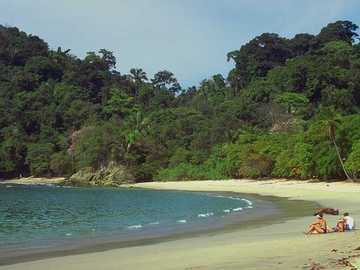 People go out and enjoy a long weekend. Mostly it is a time to relax, go out and have some fun, and toast the end of summer. Retail stores are already clearing space for Halloween and having sales on summer goods. All the goods to be sold at Christmas are already in transit on ships to arrive at major ports and then transported to distribution centers. For now all that needs to be done is to enjoy this last hurrah of summer. Have a nice weekend everyone. Friday is here and time for a musical interlude to welcome the weekend. Casablanca (1942) is one of the top 10 American movies of all time. It had great acting, a compelling story line, and some great music such as As Time Goes By sung by Dooley Wilson. Most of those involved in the movie thought it would be rather ordinary run of the mill movie that would likely be forgotten in a year of so. But world events, namely the invasion of North Africa in 1942 by the Allies propelled this movie into the realm of great movies. If you have not seen it, you should. Today is the Summer Solstice in the Northern Hemisphere. For those below the equatorial line, it is the Winter Solstice. 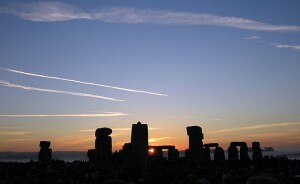 The June Solstice usually takes place between June 20-22. 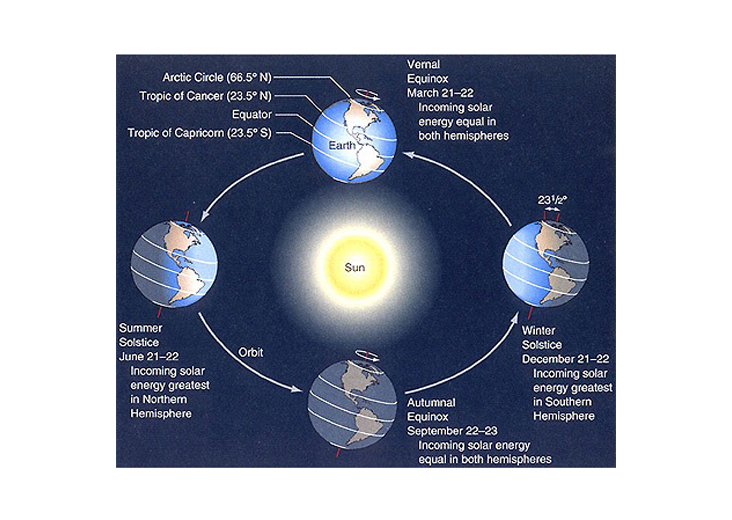 For those in the Northern Hemisphere, it usually is the longest day of sunlight as the North Pole tilts directly towards the sun. Which translates into more sunlight particularly the further north you live. For those more closer to the North Pole (Alaska, parts of Canada, and Scandinavian countries)the sun literally never sets during this time of year. Of course the reverse is true in the Southern Hemisphere. They get less sunlight on the June Solstice and the closer you are to the Antarctic Circle means less sunlight or total night. The coming of summer is usually a time for celebration in many cultures. Festivals in Northern Europe celebrate summer and the fertility of the Earth. Bonfires are lit and homes are decorated to mark the festival. Many cultures honor the sun in some fashion. Modern day pagans and druids also celebrate the day with their own festivals and many go to Stonehenge in England to witness the first rays of summer. This year summer has arrived very hot for California, Arizona, and New Mexico . The heat has been so intense that sidewalks have buckled in some areas and the power grid has been deeply hit as people race to turn on fans and air conditioning. Zorro was originally created by pulp writer Johnston McCulley in 1919 and was set during the era of Mexican rule of California (1821-1846). Don Diego de la Vega, a nobleman living in Los Angeles, adopted the identity of the masked outlaw who helped those who were persecuted by tyrannical authorities and other villains. Movie adaptations usually set the time period under Spanish rule. McCulley’s stories were not always consistent and sometimes contradictory (Zorro might die in one story and alive in the next). Zorro is a cunning foil for those he goes up against. Sometimes his targets are overconfident while others sometimes bumbling. And he delights in giving them their comeuppance. 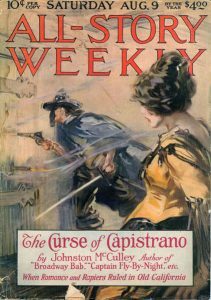 There have been many movies made telling the Zorro story starting in the silent era all the way up till recent times produced in the U.S., Mexico and Europe. There have been both live action and animated television series as well. One of the more notable ones was Disney’s Zorro that ran from 1957-1959 on ABC. It ran for two seasons before a dispute between Disney and ABC over ownership rights cut the show short. It was kept alive for a series of 4 one hour movies using the same cast. The dispute was resolved but Disney felt it had run its course. In the Disney version, Don Diego de la Vega was portrayed by Guy Williams (later of Lost in Space) for the entire run of the series. The Disney Zorro used arcs that would span several episodes. The first season was primary with Zorro battling wits with Captain/Commandante Monastario. The second season had several different arcs such as dealing the the attempts to seize California from Spain by a self-made tyrant, dealing with corruption in Monterey, or involving characters that spanned several episodes. What made Zorro so interesting is that he was clever, a good fencer, employed clever strategy, and rarely did he kill his foes (it did occur but not often by his hand but by some other means). The Disney version also used comedy to lighten the mood, often to good use. While originally filmed in black & white, the episodes have all been colorized. There are different places you can buy them though the original Disney versions can be expensive. Beware of pirated collections sold through some websites. They simply recorded it from the Disney Channel and is not very good resolution. The Family Channel did a remake called The New Zorro (or just Zorro in some cases)that ran from 1990-1993. It is a worthy successor in its own right though I think the opening theme from Disney’s version is better. A rare photograph of the ill-fated Titanic,which was bought for “a song” at a country auction, is now set to fetch hundreds of pounds when it is auctioned again next week. The black and white photograph, in a glazed oak frame, was taken shortly before the Titanic sank – with the loss of more than 1,500 lives – on its maiden voyage from Southampton to New York in April 1912. The programme argued that long-hidden photographs from the time showed that the Titanic’s hull had supposedly been damaged by a fire before it set off on its only journey, leaving it weak and susceptible when it hit an iceberg in the Atlantic Ocean. In the documentary, Moloney noted that researchers had known about the fire before but had tended to dismiss it as an ‘irrelevancy’, arguing that it should have been taken more seriously as a cause of the sinking. The documentary also claimed there were other issues which contributed to the ship sinking, such as substandard materials and shoddy workmanship, primarily due to cost-cutting. However a team of seven maritime historians has published an article completely refuting the programme’s claim that the coal fire was one of the main reasons why the ship sank. “However intriguing the claims set forth in Titanic: The New Evidence may be, they run counter to a wealth of well-researched facts about the ship and its sinking,” said J Kent Layton, a Titanic historian. 3. James Cameron really has a thin skin it seems when it comes to certain aspect of his famous Titanic movie. Fans debate the many points of this and that in the movie. One such example is whether or not Jack could have fit on the door Rose was on. Now I have not spent any real time dwelling on this point since we know this is just a movie. Apparently it got the attention of Mythbusters and they proved it was possible for Jack to have survived on the floating door with extra buoyancy. Okay that ought to have more or less settled it and we could move on. Not Cameron. So he recently commented on it by saying Jack would never have survived and that Mythbusters was full of poop (he used a barnyard word that is far more graphic for this family friendly blog). Of course he was on that episode of Mythbusters and never said is was all poop. He does say it was in the script he was to die. Okay. Moving on.